This was just one of the colorful dishes we prepared today in our “Eat Your Colors” workshop. These little, tasty orbs of giant sized nutrition are delicious all year-round but are at their height of flavor from July until well into fall. Cherry tomatoes are off the charts with vitamin C, are a super antioxidant, have abundant lycopene that helps the heart and is a strong cancer fighter. To get the greatest amount of lycopene choose organic tomatoes and find the deepest red color possible. The cornbread center is a great taste partnered with the tomatoes, basil and garlic. Drizzle a little olive oil in the bottom of a casserole dish. NOTE: if you love an intense garlic flavor rub the sides and bottom of the dish with a fresh cut clove. Cut all of the tomatoes in half. In a food processor , process the cornbread (or corn muffin) until you achieve an even crumb. Add in the basil, garlic, parsley, sea salt, black pepper and process just a few seconds. Then add green onions pulsing a second or two. Drizzle 2 tablespoon of the olive oil into the crumbs and pulse briefly to distribute. Place half of the grape tomato halves into the prepared dish. Sprinkle half of the parmesan over this. Garnish with fresh basil chiffonade. These beauties can be served hot from the oven, warm, or at room temperature. Place in a cold oven and preheat to 425º. Watch closely as not to burn butter. As the butter melts add the dried onions. Add wet to dry and just mix till moistened. Do not over mix. Return to oven and bake 20-25 minutes. Flip cornbread on a chopping block and cut into 8-10 wedges. Start pasta water for elbows. 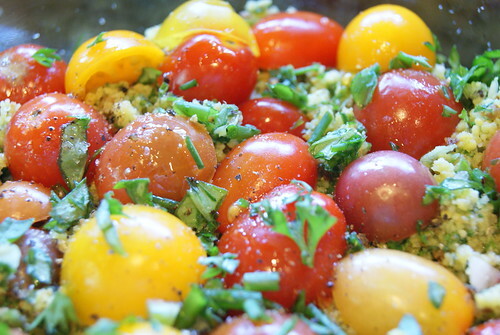 Add the kale, tomatoes and wine and cook until wilted with lid on over low heat for 6 minutes Add seasonings. 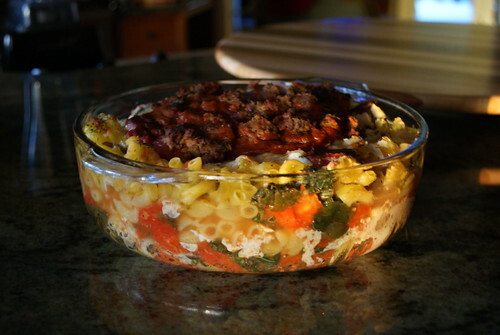 In a large bowl gently fold together cooked pasta, kale mixture, olives, cheeses. If you are missing meat you can toss in meatless crumbles like Bocca brand. This is one of my favorite dishes to turn people on to Kale with. 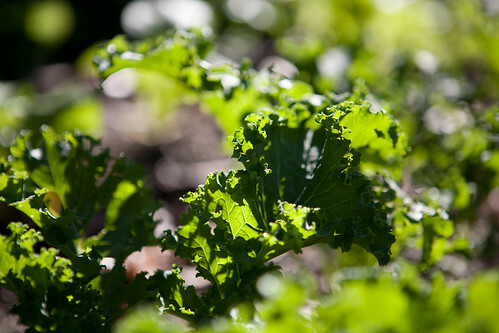 This nutritional giant is plentiful in the spring as well as fall. Besides being a beautiful dish it has everything you need for a satisfying, yet healthy meal and is spectacular to see all of the great colors. (Remember: Color signals nutrition) The lemony sauce is distinctively delicious with the tarragon and makes the dish so full of flavor. Make sure that you pour the sauce over the mixture of potatoes and kale while they are hot. 1-Steam or boil whole potatoes till just tender. While you are waiting for potatoes to finish cooking prepare sauce. 2-Combine vinegar, lemon juice, ½ t. tarragon, 6 T olive oil, salt and pepper to your taste. Set close by. 3-Drain potatoes and slightly cool. Cut into smaller pieces and place in large bowl. Cover to keep warm. 4-Next heat a skillet over medium heat and quickly add 1 T olive oil and onions sautéing until translucent. Quinoa is a tiny, ancient Peruvian seed with a mild, nutty flavor, which is often used like a grain. The protein content reigns supreme at an average of 16%, compared with 7% for rice, 10% for millet and 14% for wheat. Some varieties of Quinoa have more than 20% protein content. This recipe is a great way to “beef” up dinner so you can serve a meatless meal with plenty of nutrition as well as protein and it is delicious! Place the quinoa in a fine-mesh strainer and rinse under cold running water until the water runs clear. Bring the broth to a boil in a medium saucepan over high heat. Add the cleaned, drained quinoa and salt and return to a boil. Reduce the heat to simmer, cover, and cook for 15 minutes or until tender and the liquid is absorbed. Meanwhile, in a large bowl combine the chickpeas, tomato, garlic, lime juice, cilantro, parsley, oil, and spices. Add the cooked quinoa and toss to coat well. Serve with avocado slices or on a bed of lettuce.